De l'accouchement dans les cas de foetus thoracopages. Journal : Annales de gynécologie et d'obstétrique ; vols. xxvi & xxvii. Paris : G. Steinheil, 1887. Description : vol. xxvi, 422-437 p.; vol. xxvii, [1 l.] pl. ; ill.: 1 photo. ; 8°. Photograph : 1 photographic leaf representing a fetal specimen of conjoined twins. Subject : Monsters — Thoracopagus. In an elaborate paper on this subject, Alphonse Herrgott,* of Nancy, describes a case of his own in which the junction was through the abdomen and thorax. One of the children had a double hare lip. His conclusions relative to the delivery of such monstrosities are interesting. He states, First: That nature alone is incapable of delivering the monstrosity. Second: The foetus is dead or dies a few moments after birth. Third: That the diagnosis cannot be made until after delivery. Fourth: The most favorable position for delivery is the feet. Fifth: When the head presents, version should always be attempted. Sixth: If version cannot be made, then the forceps may be employed. Seventh: If this cannot be done, craniotomy may be performed. Eighth: If the foetus presents transversely, version by the feet would cause the presention of the other foetus. Ninth: In all cases, no matter what may be the presentation the accoucheur need have but one object, viz. : to save the mother. 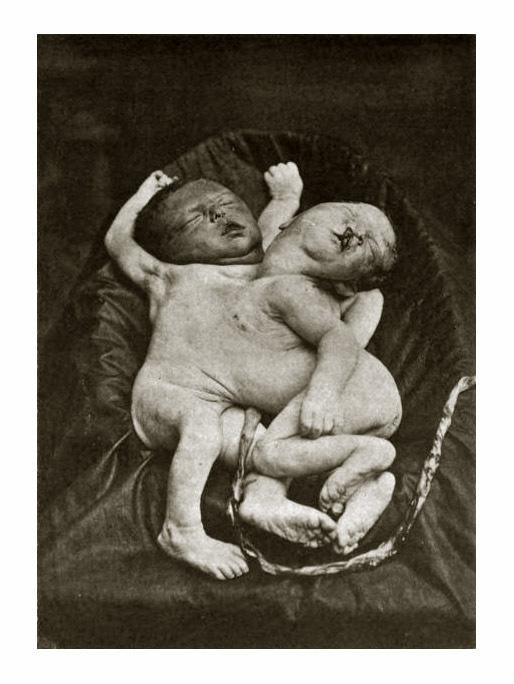 — From Helmuth & Seward, Two cases of double dichotomy — thoracophagi, omphalophagi — conjoined twins. Published in North American Journal of Homoeopathy (New York: Journal Publishing Club vol. xii, 1897). A lithograph copy of this photograph was used to illustrate W. Xavier Sudduth's paper, Embryology, anomalies, and monstrosities, published in volume v. of the journal, Annual of the Universal Medical Sciences (Philadelphia & London: F. A. Davis, 1888; facing p. 448). Also a woodcut of this photograph appears as Fig. 22, facing page 938 of the first volume of John Keating's, Cyclopædia of the diseases of children (Philadelphia: J. B. Lippincott, 1889).